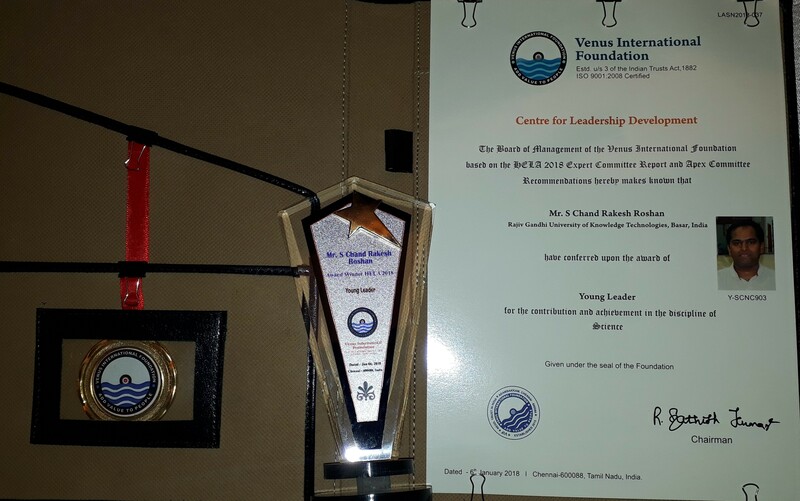 RGUKT Basar FACULTY Mr. S.C.Rakesh Roshan BAGS “YOUNG LEADER IN SCIENCE AWARD"
He has been awarded with “Young Leader in Science Award" on 06th Jan 2018 at Higher Education Leadership Awards (HELA 2018) held at Chennai. The award carries a Bronze medal, Memento and a Certificate. Mr. S.C.Rakesh Roshan is currently an Assistant Professor and Head, Department of Physics at Rajiv Gandhi University of Knowledge Technologies, Basar, Telangana. His current research areas include Simulation studies, ab initio calculations and Nuclear structure studies. He presented his research work in more than 10 National and International conferences so far. He published his first book in 2017 in the area of Liquid Crystals. 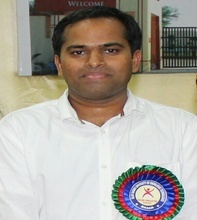 He is awarded with NASA Teacher Award in 2013 and appreciation for successfully guiding students to meritorious positions in Annual NASA AMES Space Settlement Contest held worldwide. He is also the Head, Department of Physics and member, Board of Studies, Department of Physics, RGUKT Basar. The Department of Physics had also Organized Outreach Programs in local ZPHS Schools for educating Science in Dec 2016. 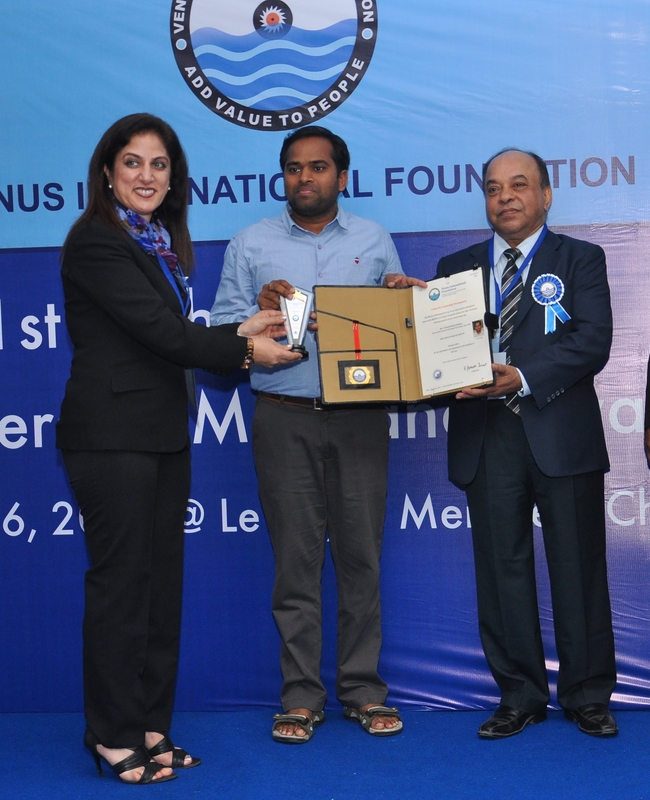 He has also received Certificate of Appreciation (Twice) at National level for successful execution as SPOC of NPTEL, 2017 and for award of RGUKT as one of “Top 50 Local Chapters” in Country. He is also the main Coordinator of "One Day National Workshop on NPTEL" jointly Organized by NPTEL, IIT Madras and RGUKT Basar at RGUKT Basar, Telangana, 29th July 2017. He is also the Organizing Secretary for International Conference on Advanced Functional Materials, ICAFM 2017, Dec 18-20, 2017, RGUKT Basar. He was an Invited Speaker on the occasion of National Metallurgists Day 2016, Dept of MME, RGUKT-Basar. He is also Member of Central Technical Committee for Conduction of University Technical events. He also served as the Associate Editor for RGUKT University Newsletter. Currently he is also the Faculty Incharge for Placements, Training and Placement activities for the University (RGUKT Basar). He believes in Multitasking and also a firm believer in the principle of Actions speaking Louder than words. His other interests include playing Badminton and Cricket.